Dressed like a pro in some Cannonade-Garmin kit! 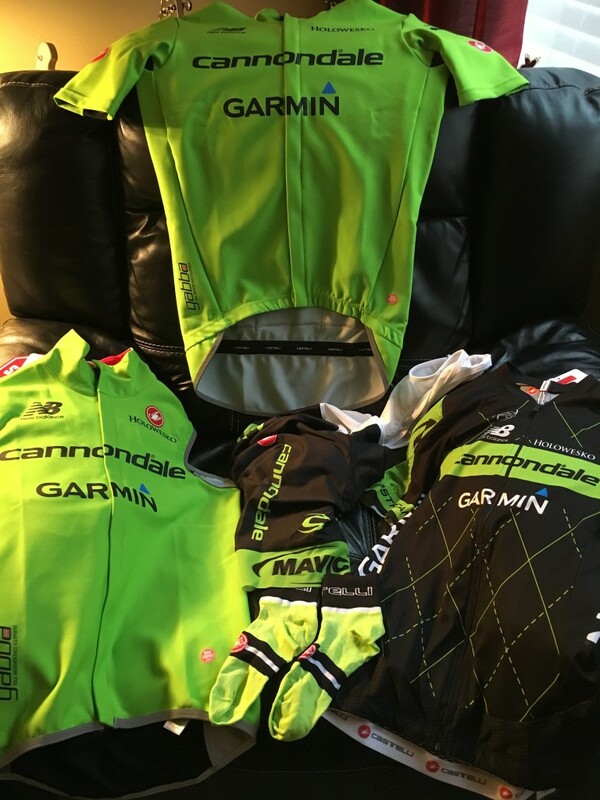 Now normally I wouldn’t buy a pro team kit for fear of looking like a Fred, but when it’s 50+% off and I ride the equipment in question I just can’t pass it up especially when it’s specific pieces I have always wanted to get but would never pay full price for. From left to right we have the Fawesome 2 vest, Gabba 2 short sleeve jersey, Aero Race 5.0 jersey and in the center there is the Volo bibs and a pair of matching Castelli socks. The Gabba 2 jersey has been on my radar for a while, it’s a staple of the pro peloton even for non sponsored teams and it quite the piece of it. It’s essentially a soft shell jersey so it’s great on those cool questionable days without the need for a vest and can be paired with a pair of arm warmers. It also has a drop tail to keep spray off your back side should the weather take a turn for the worst. The Fawesome 2 vest is made of the same material as the Gabba but it’s obviously in a vest form. This is a huge improvement from my current nylon style vest which despite a bunch of venting still doesn’t breath as well as I’d like it to. The Aero Race jersey is new for me. I was planning on purchasing the Team 2.0 jersey (it’s they same cut but different material) but my size was sold out so I went for the Aero Race. Fit is as you’d expect but this thing is lightweight! It’s going to get a lot of use during the summer that is for sure. The Volo bibs are also new for me. I have several pairs of Free Aero Race bibs in different kits and they are alway comfortable with the Progetto X2 chamois. I have read reviews to stay away with from bibs with the KISS chamois which is what the Volo has but I figured since they were on sale and the Aero Race bibs weren’t available in the team colors I’d try them out. So far I am pleased with them. Fit is like the other bibs and the chamois is comfortable at least on the hour trainer ride I did. More testing still needs to be done but I think they will be fine for longer rides. Overall I’m very impressed with these pieces of kit. I’ve always been a fan of Castello kit and have several others in my closet. These items are just the icing on the cake now!